If anyone has been following my Instagram stories lately, you might have noticed that I have been in a little bit of a "rut". It's the 5th week of classes, I've been fighting a little bit of a head cold, I have a million things going on, work is getting busy, we are trying to get projects done around the house before the weather turns and I have just been feeling blah. I come home and just want to do nothing but sit on the couch and watch TV and avoid my responsibilities.... hence, I am in a no-motivation rut. I feel like I hit a rut like this every semester at some point. Once the excitement of starting a new semester wears off and the hype of exams hasn't set in yet, I get super burnt out and unmotivated for a time. However, I really don't have time to give in to this. I am a busy law student and lazy time is not built into the schedule. 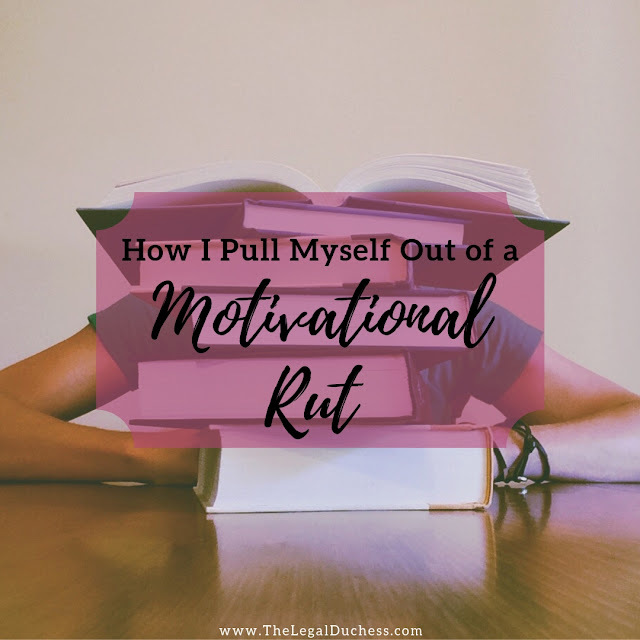 As this has happened to me several times, I have established a little routine for pulling myself out of the rut. It might not work for everyone, but this does work for me! Whenever I get feeling like this, I try to give in a least one evening or one Saturday and be at my utmost laziest. I let myself be chill and binge Netflix and pretty much be a useless human being for a little bit. I feel like giving into my lack of motivation gets it out of my system. After a time of being "lazy", I get bored and restless and have to find something to do (it's the curse of being a busybody; I do not sit still well). The restlessness motivates me to go back to being productive and getting my crap done. Taking a bit to give in and be lazy also allows me a brief respite to let my brain relax and revive and that is never a bad thing. One of my best tricks for getting motivated is to make a to-do list. Not only does it help me to figure out exactly what I need to get done, but it also helps me to avoid spinning my wheels. Have you ever sat down at your desk knowing you have a million things to do but without an idea of where to start? Enter, the to-do list. I just grab a pad of paper and start listing all the things that are stressing me out and need to get done. Then, I start at the top and get down to business so I can start crossing things off. There is something about seeing a list that motivates me to get things done. I also love getting things done so that I can make that satisfying slash through it and know that I am accomplishing something. I usually keep a running to-do list sticky note on my computer, a list on the fridge of things to get done around the house and a list on my desk of all the things I need to do homework wise for the week (I don't joke around about to-do lists). It may seem excessive but it really helps me to stay organized and know what I need to get done. When I am feeling especially unmotivated, I start with small, simple tasks that I can get done quickly and aren't super challenging. For example, if I have 2 classes to read for, a paper to start, the vacuum needs run and the dishes need to be done, I will start with the dishes or vacuuming. Either thing is a short and simple task but it is still something I can cross off my list. By doing this, I ease into productivity with simple things and I can accomplish a lot in a short period of time. That makes me feel productive which feeds into me getting more done because I am in a productive mood. Not to mention, getting even small things done is still getting things done! Treat Yo' Self isn't just for Parks and Rec people. When you are struggling to stay motivated, make little rewards for yourself. Finish the reading for Business Associations? You get a cookie. Clean the whole house? Enjoy an episode of New Girl. Get your outline caught up? You deserve a Starbucks coffee. Cross everything off your to-do list for the day? Pop the cork on a bottle of wine! I love to entice myself to get things accomplished with little rewards. Sometimes it is simple; sometimes it is a little bigger but having a light at the end of a tunnel really helps me to put my nose to the grindstone and get sh*t done! I absolutely love your blog! This is just what I needed because I am in such a rut at the moment. I'm studying a masters in law, I just finished my law degree and my motivation is waning!